Prayaas -2011, an initiative taken by Welingkar Institute of Management to help women entrepreneurs has reached a stage where the efforts seem to be nearing fruition as their aspirations take shape. 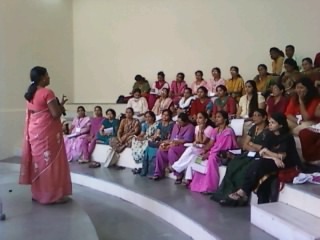 Thanks to the support extended by the enthusiastic media, 45 women consisting largely of graduates, with a lawyer, an MSW and a well known nutritionist, along with three men who were social workers from the slums of Dharavi had registered themselves for the training, so all in all there was an interesting, eclectic group that had assembled in the amphitheatre at WeSchool on the bright Sunday morning. Godavari and Jayashri, the trainers for the session had travelled all the way from remote villages near Tuljapur where they are actively associated with SWAYAM SHIKSHAN PRAYOG (SSP) an NGO that works for empowerment of women through microfinance. Godavari, a seasoned SSP Cluster Worker for Salgara and Kakramba Villages has built 45-20 SHG groups with a strong and united membership of 500 women. In 2004 she was made the secretary of the federation of SHGs in her district, a position she holds till date. In December 2005, SSK, a micro-finance company, was formed which gave women more access to loans and the status of the federation dramatically changed. As the federation secretary, she oversees activities related to community-based enterprises (CBEs) like Retail marketing, Health Mutual Fund, Toilet construction Unit and ‘Adharam’ the markets a smokeless ‘stove’ which works with biodegradable pellets as fuel ,which is turning to be such a blessing for the rural women. It was quite heartening to see the semi educated, simple rural women sharing ‘gyan’ about small savings and credit groups with their better educated urban sisters. As the sessions progressed the participants were getting more and more impressed by the complete ease with which the simple trainer duo went on to explain the various facets of micro-credit, used the mike and all other teaching aids like white board-marker pens, stepped into each other’s shoes when one of them went a little out of breath and carried each session on to its fruitful end. The songs penned by the women brought ‘josh’ in the post-lunch session and the little game introduced by them at the end drove the point home about setting up a small business and nurturing it to growth. ” As a leading B- School in the country, Teaching, Research and Social outreach are integral to the core activities of WeSchool. 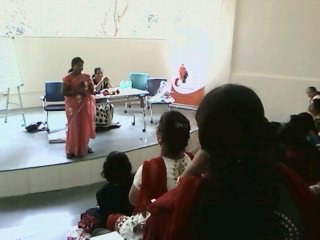 Prayaas 2011 is a long term venture of ours to awaken the spirit and encourage the women to be successful entrepreneurs. They have taken the first few hesitant steps where WeSchool came forward to give them a hand and hopefully they will soon step out of the shadows and be on their own as successful entrepreneurs. A woman who earns and has a control over her own money becomes strong, secure and is able to support and motivate others. Social empowerment, such as self-esteem, leadership in the community, economic empowerment, such as running own ventures, accessing financial services, managing money and improving livelihoods are the key factors that will make Indian women strong and the leaders of change in the times to come.” Prof Dr Uday Salunkhe, Group Director-WeSchool shared his thoughts about the new women-centric initiative. it was wonderful experience to be a part of prayas. we look forward to share many more experiences like this in future.